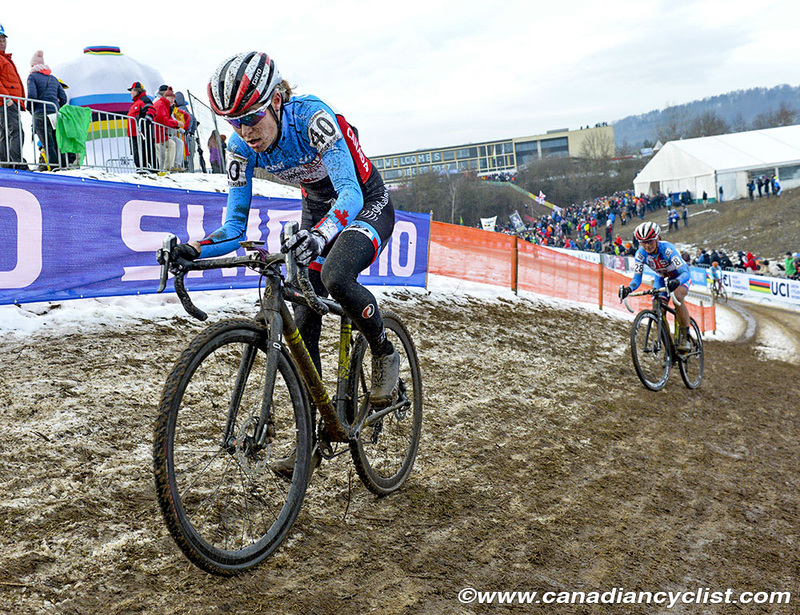 Maghalie Rochette had a breakthrough ride on the opening day of competition at the Cyclo-cross World Championships on Saturday, finishing fifth in the Elite Women's race at Bieles, Luxembourg. Ice and mud made the course extremely slick, with most riders crashing multiple times on the tricky off camber climbs and descents. Rochette, the reigning Canadian champion, came back from a poor start to join the top five at the front of the race by the second lap. When seven time world champion Marianne Vos of the Netherlands and Sanne Cant of Belgium attacked mid-race, Rochette was dropped but rode solo in fifth place for the rest of the race to finish 36 seconds down on eventually winner Sant. Mical Dyck finished 20th and Cindy Montambault was 24th. 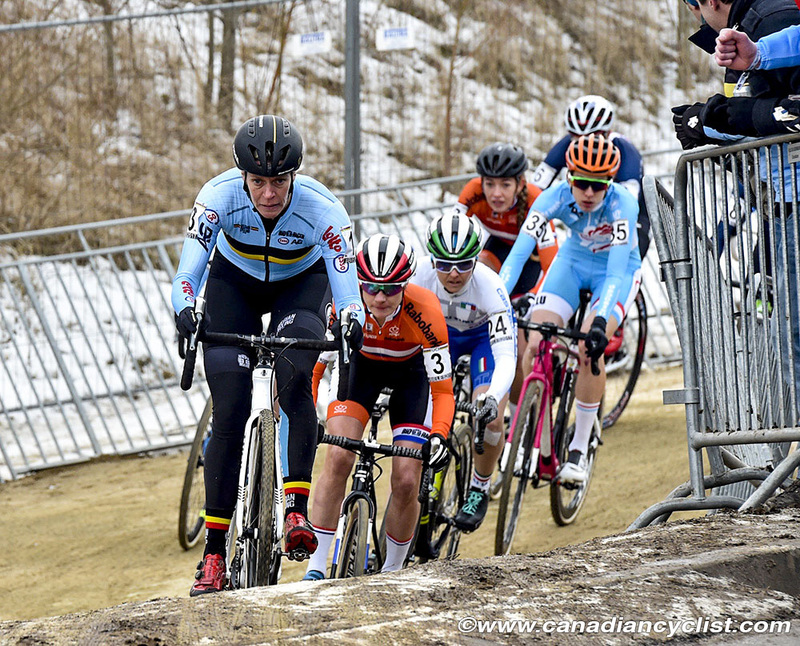 "I had a horrible start," admitted Rochette, "but I just kept paying attention what was ahead and when there was a crash I was able to get around it and I was able to catch up to the front group. After that I just kept moving forward. I had a clean race and didn't really crash, so it was pretty amazing and I'm really happy. Personally I thought the course was amazing; it was slippery but that was the same for everybody. You just had to keep clean and keep moving. We had similar conditions at Nationals so I knew how to race it. 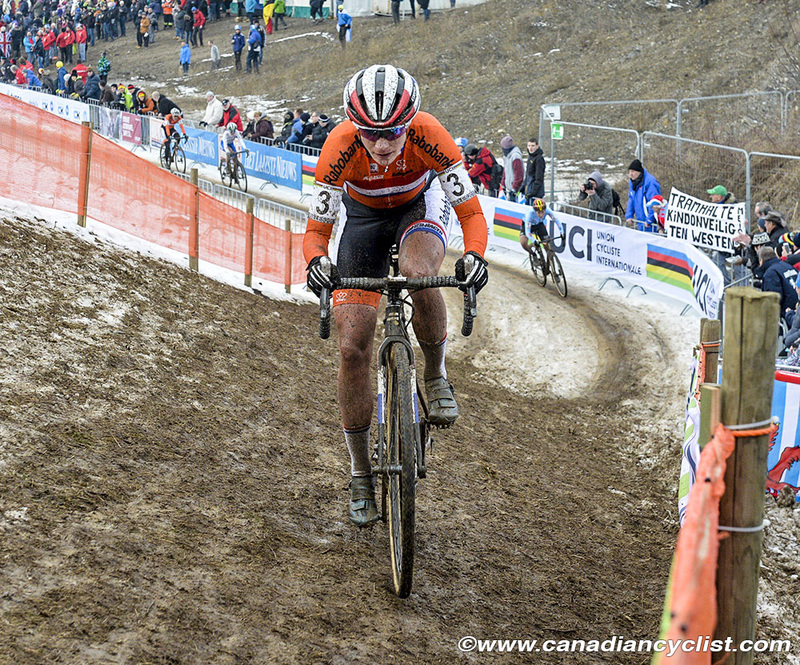 I didn't think about it [top-5] and I have a lot of people to thank - my boyfriend and coach, my family, my team mates and Cyclo-cross Canada. I wasn't expecting it, but I'm super happy and thrilled about it." Vos had opened a 6-8 second lead on Sant going into the last lap, and it looked like the Dutch rider was on her way to an eighth title. But she suffered a mechanical problem with her chain coming off, which allowed Sant to catch her, and forcing Vos to chase back. Coming onto the pavement for the final 200 metres the pair were together and the smart money was on Vos in the sprint, however, she did not have the power after her chase and gave up with 100 metres to go. 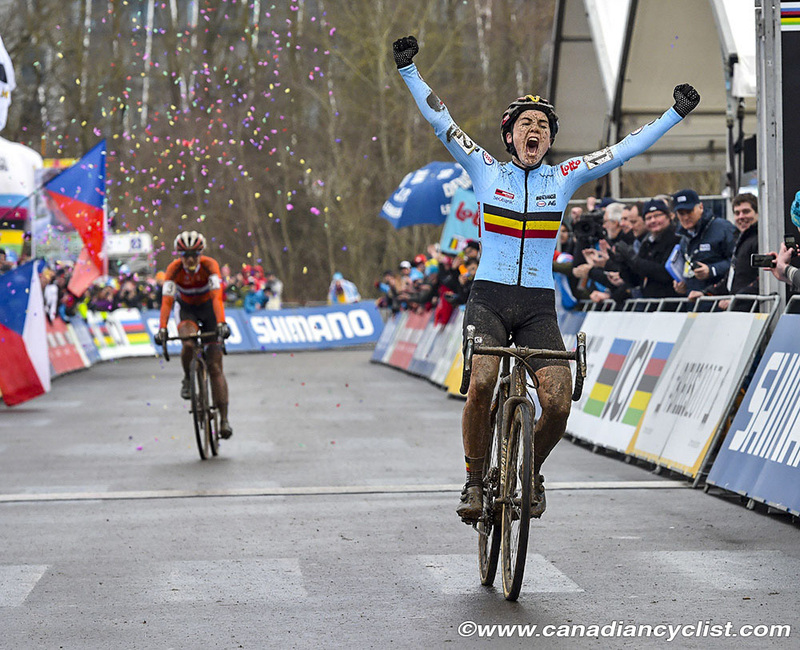 For Cant it was her first title and, remarkably, the first ever Elite women's title for Belgium. Katerina Nash (Czech Republic) outsprinted Lucinda Brand (Netherlands) for the bronze. In other competitions, Gunnar Holmgren was the top Canadian in the Junior men's race, finishing 22nd, 4:15 behind winner Thomas Pidcock of Great Britain, who led a 1-2-3 finish for the Brits. Brody Sanderson was 25th and Noah Simms 46th. In the Under-23 women's race, Canada's lone entry, Ruby West, was 26th, 6:03 behind winner Annemarie Worst of the Netherlands. Worst caught and dropped Ellen Noble (USA) in the final lap to take the title by 10 seconds, with World Cup champion Evie Richards (Great Britain) third.